There’s nothing more aggravating for a healthcare patient than driving to a pharmacy to pick up a prescription and then learning his or her insurance company won’t cover the cost. It’s a frustrating scenario for retailers and doctors, too. A significant portion of the medications the pharmacy staff fill won’t be taken home by the patient. Providers then have to go back to the beginning, contacting insurance providers to see if another drug will be covered by the patient’s insurance plan. The shift toward electronic prior authorization, or ePA, is trying to put the brakes on those system inefficiencies. This trend has been steadily gaining momentum, thanks to wider electronic health record (EHR) usage and new state-level laws aimed at cutting medical costs and improving patient outcomes. For those who work in the health care industry, it can be hard to keep up with all those developments. Each year, the technology firm CoverMyMeds works with an advisory group of industry experts to publish the annual ePA National Adoption Scorecard, which highlights the progress of ePA in the United States. Readers get up-to-date information on individual state mandates involving prior authorization, as well as updates on what’s happening at the federal level. The 2018 edition of the scorecard also includes sections on two new areas of opportunity: real-time prescription benefits (RTPB) and solutions geared toward specialty medications. 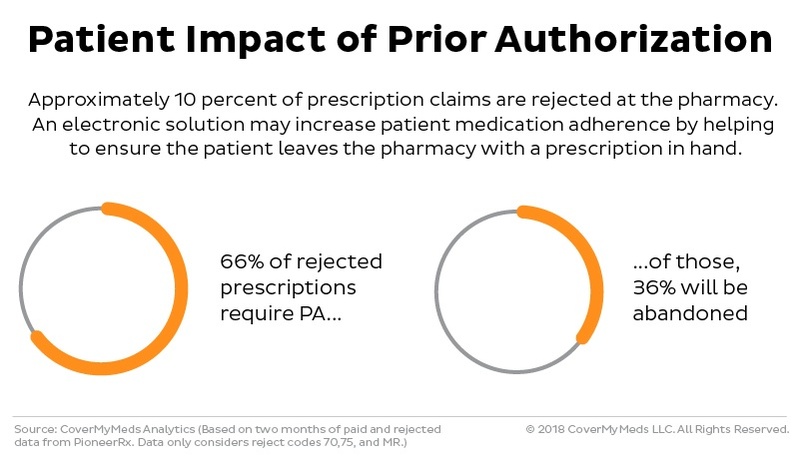 “As electronic prior authorization implementation continues to increase, the industry is looking for new ways to enhance ePA functionality to benefit industry stakeholders, to continue fueling adoption from pharmacists and providers, and to benefit the patient,” says Perry Lewis, VP of industry relations at CoverMyMeds, whose main offices are in Cleveland and Columbus, Ohio, United States. The latest version of the innovative report earned the company a Gold Stevie® Award for the Best Annual Report in the Online/Electronic category at The 16th Annual American Business Awards..
“The Stevie Award validates all the hard work we put together on our scorecard,” said the CoverMyMeds VP of industry relations, Lewis, at the awards ceremony. Even today, many prior authorization requests to the pharmacy and health plan are completed manually—usually by phone or fax. This time-consuming process often leads to patients to abandoning their prescriptions at the pharmacy 36 percent of the time, according to CoverMyMeds. That creates perils for the patient, who sees an increased risk of future health complications by not taking a prescribed medication. It also means the various players in the health care industry—providers, pharmacies, and insurance plans—allocate unnecessary resources to getting a drug approved. The scorecard notes, for example, that providers who rely exclusively on electronic preauthorization spend 2.5 fewer hours a week on these tasks. It’s no wonder, then, the sector is quickly gravitating toward ePA, a trend that the proliferation of electronic health records has aided over the past several years. ePA streamlines the process by allowing a physician or other provider to initiate the approval while using the e-prescribing feature of the EHR. “The most successful ePA strategies also connect the pharmacy to initiate an ePA that was missed at the point of prescribing, and they allow the provider to complete a pharmacy-initiated PA electronically in their EHR or in a designated ePA web portal,” the scorecard says. Today, 90 percent of insurance payers use ePA, and 96 percent are committed to implementing the method soon. Meanwhile, virtually every pharmacy chain in the country has expressed an intention to use ePA. A growing number of states are adopting ePA language aimed at speeding up the usage rate. Since its inception in 2008, CoverMyMeds has been at the forefront on this industry change, offering a platform that incorporates nearly every payer and prescription drug on the market. The company, which McKesson Corporation acquired in April 2017, now works with more than 500 EHRs, 62,000 pharmacies, and 700,000 providers in the United States. The organization launched its yearly National Adoption Scorecard in 2015 as a way to help key stakeholders stay current on legislative updates and other news involving ePA implementation. The Stevie win not only gave CoverMyMeds a valuable accolade but helped motivate the company to build on the scorecard’s success.